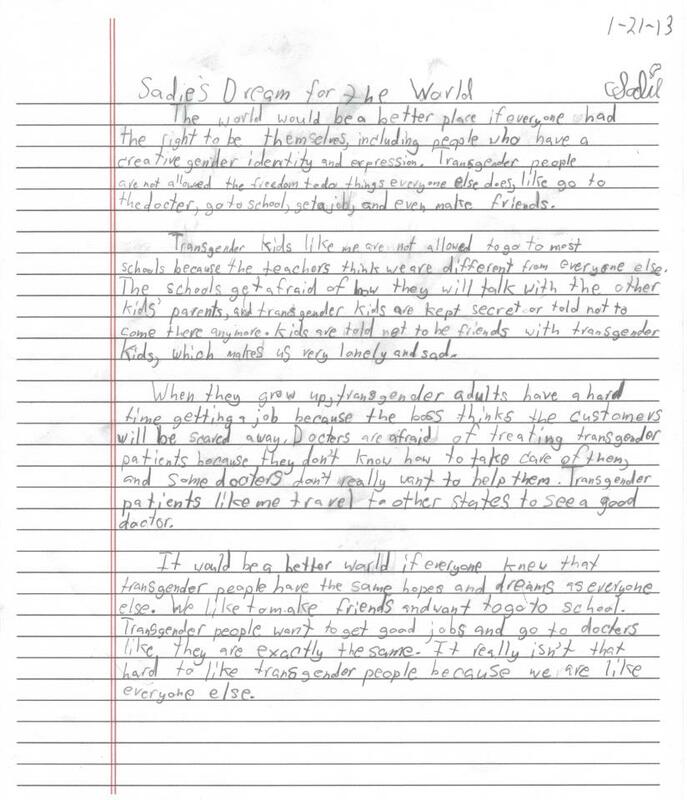 TransGriot Note: While the GL community was justifiably jumping up and down excited because President Obama mentioned them in his second inaugural address, an 11 year old transkid in the western US was writing her own essay on this inaugural day that also happened to fall on MLK, Jr Day. Sadie’s essay highlights who we adult transpeople are really fighting for when we push for trans human rights here in the United States and around the world. Let’s redouble our efforts to make trans human rights a reality for Sadie Croft and ourselves. Sadie’s Dream for the World. “The world would be a better place if everyone had the right to be themselves, including people who have a creative gender identity and expression. Transgender people are not allowed the freedom to do things everyone else does, like go to the doctor, go to school, get a job, and even make friends. Transgender kids like me are not allowed to go to most schools because the teachers think we are different from everyone else. The schools get afraid of how they will talk with the other kids’ parents, and transgender kids are kept secret or told not to come there anymore. Kids are told not to be friends with transgender kids, which makes us very lonely and sad. When they grow up, transgender adults have a hard time getting a job because the boss thinks the customers will be scared away. Doctors are afraid of treating transgender patients because they don’t know how to take care of them, and some doctors don’t really want to help them. Transgender patients like me travel to other states to see a good doctor. Sadie socially transitioned from male to female in kindergarten. She was home schooled until this year and is now in fifth grade and attending public school. A vegan, she loves anything that “protects the environment,” as well as reading, swimming, basketball and texting her friends. She listens to Lady Gaga, Pink and Justin Bieber and wants to work for Green Peace when she grows up. She also wants to be a mom. This entry was posted in Transgender News and tagged Sadie, Trans, Transgender 11 year old, USA on January 25, 2013 by jinsiangu.